Are you getting complaints from neigbors about your dog's excessive whining & howling? Learn how to take control of dog Whining & Howling. Online dog training guide for whining, howling, barking & more. Whining is one of the major problems people have with their dogs, and stopping the behavior one of the greatest challenges that dog owners face. Training to stop your dog's whining is most effective when you start early. Yet no matter how old or young your dog is, you need to begin by understanding why dogs whine. Then you can then learn more about how to stop your dog whining. Whining is a way of communicating that tells us our dog is upset, scared, or in pain. It is usually a behavioral response to being upset or feeling abandoned by his or her pack. However, if you have a dog that has never whined, but suddenly starts, you probably have a dog that is hurt or sick. Your concern does not need to be how to train your dog to stop whining, but to treat something more serious. You should go to the vet immediately. However, in many cases dogs will whine due to feelings of abandonment or fear, and the whine is their "alarm" so they can be rescued. Punishment will do little to curb the behavior, and will only increase the anxiety. Training yourself and your dog will do more to stop the whining than punishment ever will. If your dog whines due to separation, you will begin with teaching your dog to accept short periods of time that he or she will be left alone. Eventually you will work your way up to long periods of time. Start by getting your dog used to the area where he or she will be while you are gone. Stopping your dog's whining means teaching them to be more comfortable. After your have played with your dog for a while then try to leave for a moment. Your dog will probably begin to whine. This period is the biggest challenge you will face in your training periods. As a loving dog owner, the sound of your dog being afraid may hurt you, but if you return to the room right away, you teach your dog that emotional blackmail works. You will have to work hard to teach yourself not to give in to your dog. If the whining does not stop after a few minutes, which to some dog owners may feel like hours, it is then okay to go back into the room. You need to let your dog know that you are the boss, and you will return when you want to return. The continued whining probably means your dog is still not comfortable in the room, so you will need to return and play for a bit to get your dog more comfortable. After a few times of going in and out, you will start to see the whining decrease. If not, when you leave and your dog whines, give him or her a firm "No!" Then, if your dog has been quiet for a few moments feel free to shower your dog with praise. Continue this process for longer periods of time, and eventually the whining will stop. However, whining does not always occur when you leave your home. Sometimes whining happens when dogs want attention or want to play. Stopping your dog's whining in these situations usually will just take your spending some quality time with your dog playing, walking, or doing things together. You will also need to learn how to ignore your dog when he or she starts whining. If ignoring your dog does not work, then quietly ask your dog to stop whining. If that does not work, then be firm when you say, "Be quiet!" Saying it loud and even spraying your dog in the face with water is an effective way to stop your dog's whining. Eventually you will not even need the loud voice or the water. Put an end to your dog's excessive whining, barking & other issues. 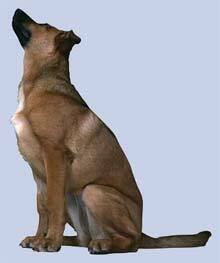 Control your dogs whining & howling at night time.